We have 4 log cabins along the creek that have become popular since being built in 2009. Each sleeps 15 in bunks with showers and bathroom facilities. There is adequate space for cabin group time. Each features a large porch overlooking the creek. 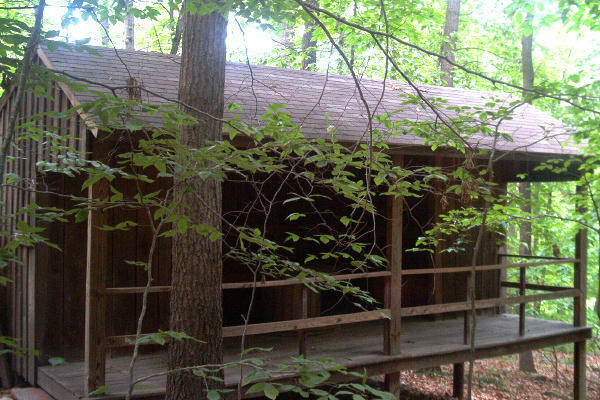 Shiloh cabin is wheelchair accessible. 10 motel-style bedrooms (up to 4 per room- 1 queen bed, 1 bunk-bed), a cozy lounge area with a fireplace, and two large meeting rooms. The building has air conditioning and is handicap accessibility. Linens are provided. Has 4 bedrooms sleeping 16 persons total: 2 bedrooms upstairs and 2 bedrooms on the main floor (double beds and bunk-beds). There is a carpeted lounge area on the main floor with a large wood-burning fireplace. There are 2 restrooms and 3 showers downstairs. This is a double cabin that has two identical rooms on each end. The 2 sides can be closed off and used as two separate cabins or the middle doors can be opened and used as one large cabin. Each side sleeps 22 persons. There are showers and restrooms on each side. Goshen is on the left as you look at the front of the cabin and Jaffa is on the right side. Bethel sleeps 16 people in bunk style with a restroom and 2 showers in the building. This building, with one double bed and one bunk bed, sleeps 3-4 persons and has its own bathroom/shower. This is often used for the speaker or group leader. When not booked for retreats or summer camp, Berea is available for pastors and full time ministry staff to use for a personal retreat at no cost. There are 6 three-sided cabins which sleep 10 persons each. They are located in the Wilderness Camp area.